"Two mathematicians went into the desert" ... is not the start of a joke, but the reality of mathematical research. Mathematician Nathalie Vriend and her PhD student Mathew Arran have just returned from Qatar where they went to study sand dunes. 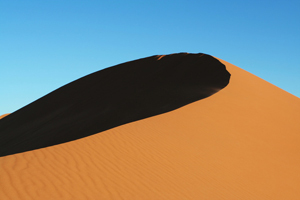 Understanding the behaviour of dunes doesn't just help us understand the desert, but also the behaviour of other materials made up grains, such as snow or sugar. 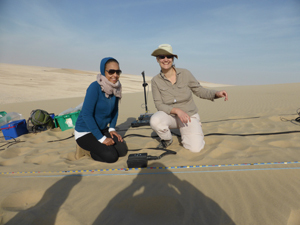 "We will go to a dune field and investigate the internal structure of these dunes using ground penetrating radar and localised sampling," explained Vriend before her departure. Because Vriend and Arran are interested in the movement of grains, and particularly in avalanches, they will be looking at so-called barchan dunes — these have the familiar crescent shape that springs to mind when you think of the desert and, crucially, they travel fast. Being driven along by the wind a small barchan dune can travel around 20 metres per year, depositing itself in a completely new location after two to three years — that's pretty quick for a dune. "We want to understand two things," explains Vriend. "The first are the granular processes. When a dune moves you get [an accumulation of sand grains] close to the crest that starts to avalanche, so you get layers of individual avalanches on the down-wind side. Secondly, we are interested in the big picture; how fast do dunes [as a whole] move and how do they interact with each other?" The micro and macro processes are connected of course, and this is exactly where the main question lies. "I'm interested in connecting the small processes at the grain scale with the large processes at the dune scale. There must be a relation between the two, but not much is known about it." Nathalie Vriend explaining the ground penetrating radar procedure.. The results of the research will be interesting in a wider context. "Avalanches happen everywhere, not just in nature, but also in industry," says Vriend. "Our understanding of avalanche processes can be very relevant in a variety of problems." As an example, think of granular materials like coffee beans or sugar grains. If in a factory these are dumped on piles, you will get continuous avalanching along the layers of these piles. In nature you might think of snow avalanches driving over thick snow packs, so that some of the packed snow is eroded and some deposited again, just like the sand in a moving barchan dune. "Those processes are very similar to the things we will study in Qatar. There are definitely overlaps in the physics we want to describe." Matthew Arran pouring resin into a sand core, to lock it in place and transport it back to Cambridge for further analysis. On their Qatar expedition, Vriend and Arran were particularly interested in tell-tale patterns that occur within dunes, due to the fact that the dune marches slowly across the desert floor. Sand blown by the wind accumulates at the crest of the dune and avalanches down. When an avalanche deposits a sheet of sand, smaller grains will trickle through, resulting in a small-grained layer covered by a layer of larger grains. A succession of avalanches will result in a streaky pattern of large and small grain layers. Vriend and Arran had previously observed such a pattern in a smaller dune. The measured length scales between layers suggested they were down to either day/night variations in wind strength or mechanical processes during an avalanche. The question was which. By comparing a small dune to a larger one, they got a vital clue. A larger dune moves along by only around 5 metres per year, compared to the 20 metres of a smaller dune. If the streaky pattern were due to the cycle of day and night, then you would see 365 individual layers squeezed into a sand sheet at the front that is 5 metres thick for a larger dune, and 20 metres thick for a smaller one. In other words, the layering for the larger dune would have to be finer, as more layers need to fit into less space. What Vriend and Arran observed, however, was an equal spacing of layers in both dunes, suggesting that the layering isn't related to the daily cycle. The streaky patterns were detected using ground penetrating radar as well as cross-sectional slices taken out of the dunes. It wasn't an easy task. "At first we were literally blown off our feet; the wind was so strong." says Vriend. "It was really difficult conducting experiments in those conditions." But it's not all about battling the elements; sometimes it's fine to go with the flow. 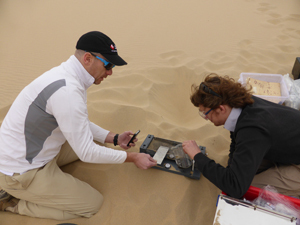 "The large Qatari dune we studied in this research also has another mystical feature: when we slide down the steep face during our experiments, the dune starts to make an unusual and eerie sound," explains Vriend. "This loud sound, known to come from 'booming sand dunes', actually formed the topic of my PhD thesis in 2010." Don't think that mathematicians don't have fun!